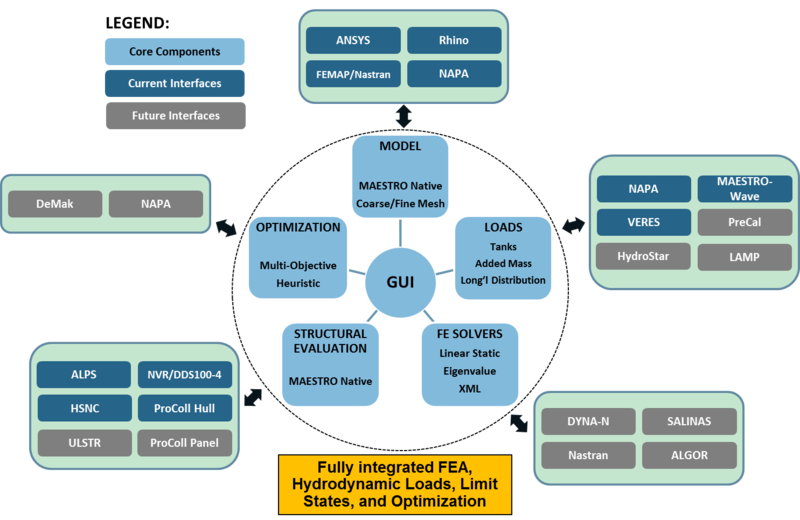 MAESTRO’s modeling paradigm is organized to rapidly generate a finite element model of an entire ship. Using high-level building blocks, MAESTRO can leverage longitudinal uniformity typically found within portions of a ship. MAESTRO offers numerous ship-based loading patterns to accurately and efficiently produce the necessary load cases. In addition to calculating displacements and stresses using the finite element analysis method, MAESTRO also performs an automatic failure evaluation of the principal structural members. The MAESTRO-Wave module provides the ship designer with an integrated frequency-domain/time-domain computational tool to predict the motions and wave loads of floating structures. The SFA module provides the ability to perform global fatigue screening of the vessel and introduces additional functionality to the ELA module. MAESTRO is a design, analysis, and evaluation tool specifically tailored for floating structures, and has been fielded as a commercial product for over 30 years with a world-wide user base. MAESTRO’s history is rooted in rationally-based structural design, which is defined as a design directly and entirely based on structural theory and computer-based methods of structural analysis (e.g., finite element analysis and structural limit state evaluation). At MAESTRO’s core is a structural design tool developed to suit the needs of ship designers and naval architects. Further, the MAESTRO development staff and support team are themselves naval architects who understand the ship design and analysis process. The MAESTRO Technology is organized within an open software architecture, with a set of core components, and integration with supporting software modules and interfaces. The MAESTRO Technology depiction below highlights the key functional and integrated features of this advanced system developed specifically for the structural design, analysis and optimization of ship structures.